Hello, friends! I'm excited to announce that I've decided to join the spring One Room Challenge as a guest participant! 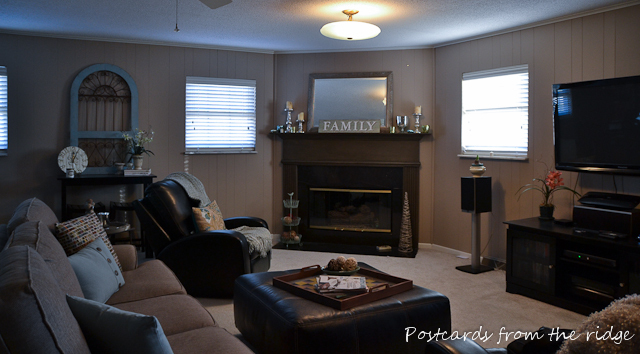 I'll be spending the next 6 weeks giving our family room a fresh new look and I can't wait! It won't be a total gut job, but there will be new furniture pieces and several small projects that will make a huge difference in here. 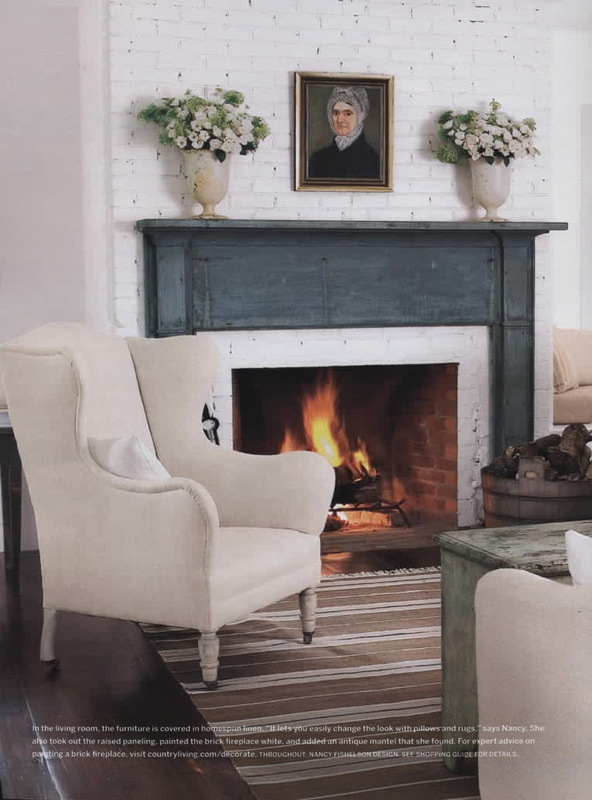 The goal is to lighten and freshen the space. We spend a ton of time in here and it's time for the darkness to be driven out, lol. Here's how the room has looked for the past several years. All of these photos are from 2012 and 2013, so it's definitely time for something fresh in here. Plus some of the furniture is just worn out. I know I just shared plans for the living room, but this room has gotten bumped ahead of that one. I'll get to that one eventually! I don't know what I was thinking when I painted these bookcases dark. I saw something like it in a magazine and knew as soon as I finished the project that it was too dark. That was 7 years ago! 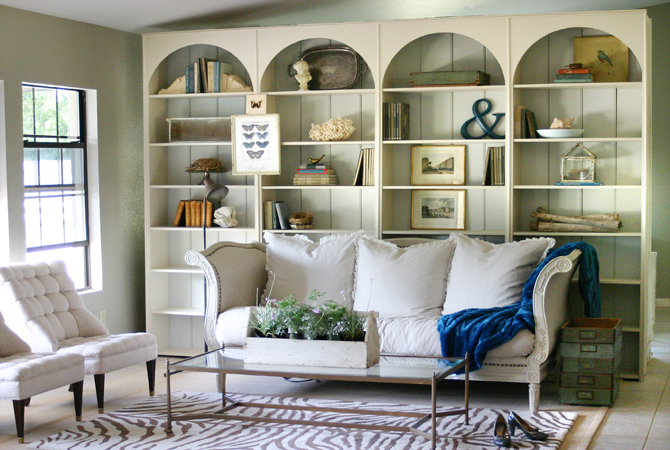 I've wanted to repaint it for a couple of years and shared some of my favorite bookcase styling ideas HERE. I've done the best I can in here with just changing out the decor. This is how it looked last fall. 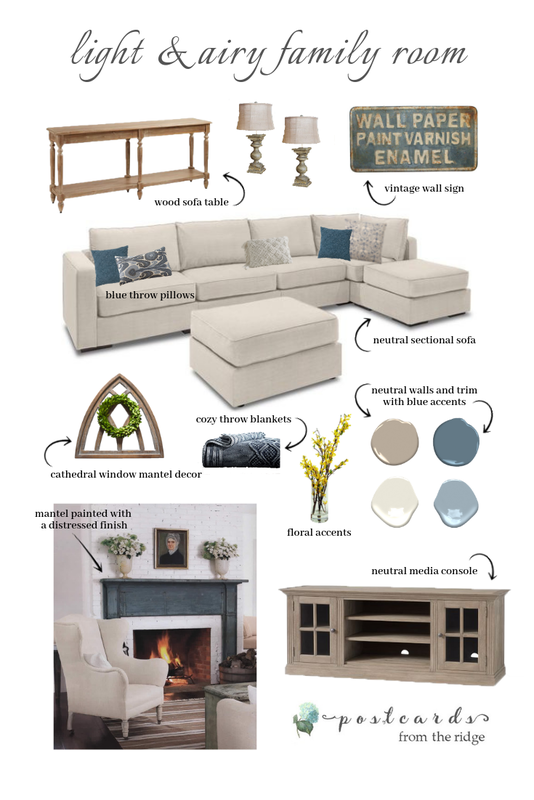 Here's what I have planned for this room. With a few changes it will look very different in here. We'll be adding some new furniture. The black recliners and ottoman will be going away and the sofa that's currently in here will be moved into the living room. New pillows and a new throw blanket are planned for the sofa. And I'll be changing the decor in the bookcases and mantel. I have a new "vintage" sign ordered for the room also. You can see it in the mood board at the bottom of the post. The bookcases will probably be the biggest paint project because I'm not totally certain that I'm going to change the wall color in here. It's a huge project and I'll just have to see how my back is doing (and my motiviation, lol). Plus it's already a nice neutral and is in great shape. The hutch in the home office corner. Probably the mantel and black marble fireplace surround. I'm so tired of all of the dark elements in here. Here are some of my inspiration photos. This built-in is almost identical in style to ours. I love the way it's styled with a mix of artwork, accessories, and books. I'm hoping ours will resemble this when I finished the makeover. See more of this bookcase HERE. 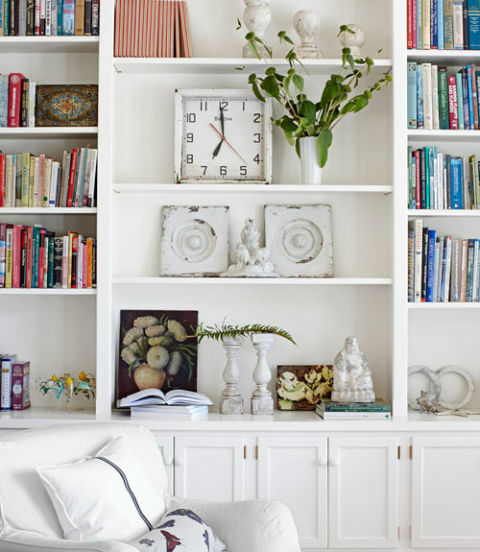 I love the cottage-y styling of this built-in bookcase. I'll probably have some similar accessories. The fireplace are will be getting some type of update. I love the look of this and might try to recreate something like it for the mantel. The sofa will be a light neutral that I can use any color pillows with. And here's the plan for the room. I'm sure it will be tweaked a little from what you see here. I haven't finalized all of the accessories so watch to see how it ends up. Benjamim Moore Pismo Dunes, Soft Chamois, Winter Lake, & Philipsburg Blue. 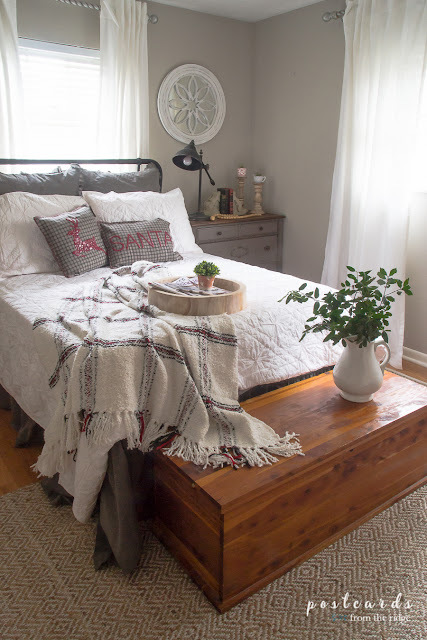 Our guest bedroom was given a makeover as part of the One Room Challenge HERE. 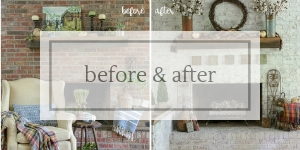 See my recent, very low budget entry makeover with fern botanicals HERE. You can get your own set of printables for free too! 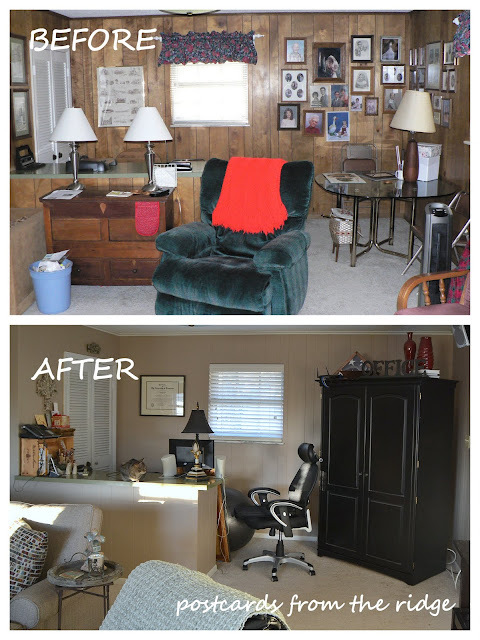 Love seeing before & afters and room makeovers? See all of mine since 2011 HERE. I'm looking forward to seeing how you transform this space! Thanks friend! We've researched and agonized over our sofa but feel comfortable (pun intended) with our choice. Yes, great minds think alike! Can't wait to see your finished space! It will look so pretty and bright when you are done, i will be waiting for updates. Thanks. Marlene! I hope it looks as good as it does in my mind! Hi! Thank you! I'm anxious to be done with it. 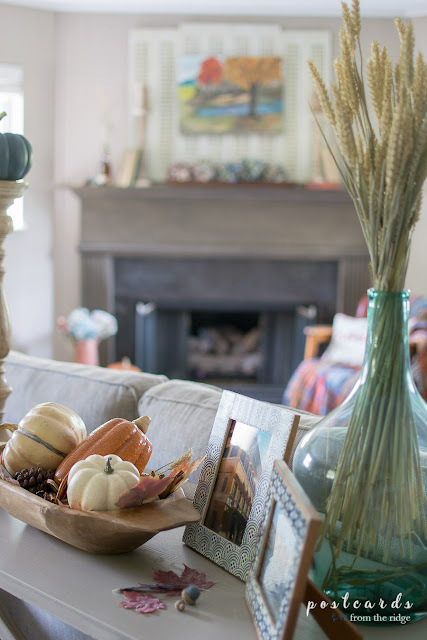 Let me know if you need ideas for your ranch house. There's a lot you can do with them! I love the inspiration photos! It's going to be beautiful!! The colors in your inspiration photo are so tranquil feeling. 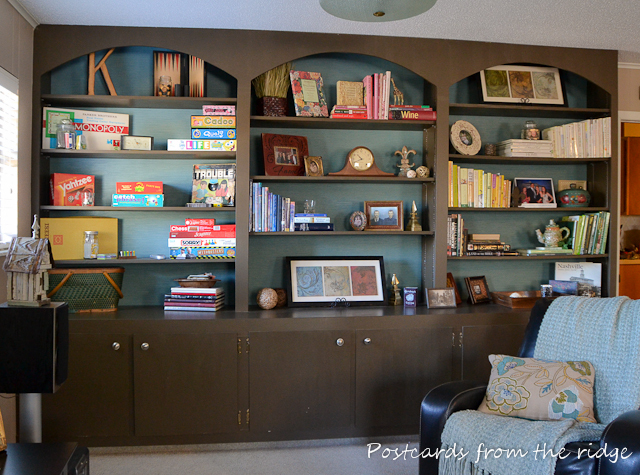 I think painting the bookcases will make a world of difference and I can't wait to see the finished space! 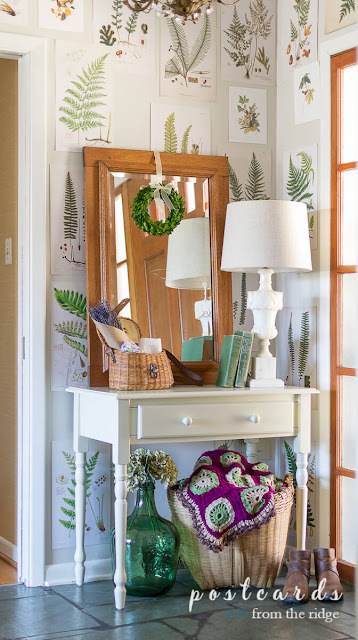 I adore your plans for the One Room Challenge! 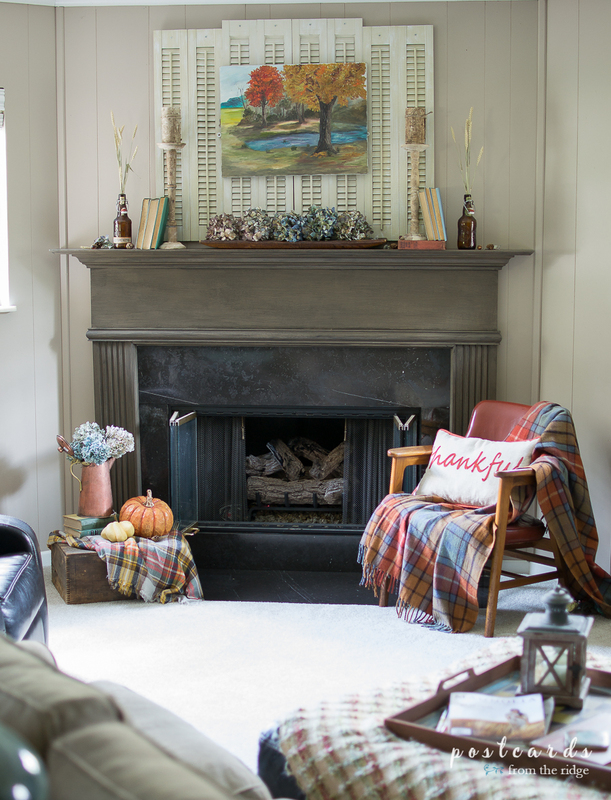 as our Family Room is on the lower level and I can truly use some inspiration! I love your inspirational mantle! Thank you for always inspiring! Angie I love the pretty color pallet you have selected for your project it will be very impactful in your space.